John Millard was born at Beanhall Lane, Fretherne, on 1 May 1899, the only son of John Millard, a bricklayer, and Rose Edith née Derrick. He had three older sisters, Florence, Elsie, and Violet, and was followed by Lucy and Elizabeth. By 1913 the family had moved to The Green, Frampton. 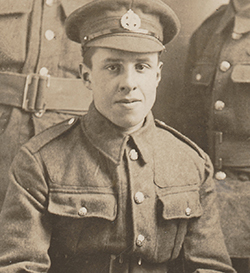 John enlisted for the Army at Stroud on 11 December 1916, but was not mobilised until 1 June of the following year. He was then listed as a munitions worker, classified as 'G40', which was presumably not one of those reserved occupations that were normally given higher priority than conscription into the Services. He was initially posted to the 5th (Reserve) Battalion of the Rifle Brigade, but on 3 April 1918 he was transferred to the 12th (Service) Battalion in France (see also our Gallery photograph). John served as a rifleman (equivalent to a private), and his records show two sentences of Field Punishment No. 2 which meant the wearing of handcuffs and fetters, and therefore could not have been awarded when he was on the front line : on 19 June 1918 he was given 28 days for being asleep on duty (for which soldiers on the front line had been shot), and on 26 June a further 14 days for being 'generally dirty on defaulters' parade'. Two spells in hospital were recorded later; for dysentery in July-August 1918, and again in November 1918 to January 1919. ​Nevertheless, on 3 February 1919, John volunteered to re-enlist for a further four years, this time into the 1st Battalion of the Gloucestershire Regiment, and was sent home on leave pending this change. During this time, however, he was examined at the Special Military Surgical Hospital at Southmead, Bristol, with swollen neck glands. After an operation, and a medical review that found he had very bad teeth, he was discharged at Bath War Hospital on 9 August 1919 as permanently unfit for military service, with a £5 gratuity. He was awarded the Silver War Badge and later the British War Medal and Victory Medal. His war service is commemorated on the plaque in the village hall. John lived with his parents until his marriage in 1924 to Maggie Doris Knight Harris. Their first home was Oatfield Cottage, where John George and Albert Wilfred (Bill) were born, after which they moved to Ward's Court where their family was completed by the arrival of Doris Christine and Derrick Henry. In 1939 John was a builder's labourer; his son, Derrick, recalls that he cycled to Droitwich to get work for a while, coming home for weekends. John Millard was buried on 10 August 1960 in St Mary's churchyard after battling with Parkinson's disease.